Ballet companies everywhere are trying to stay relevant, agonizing over how to build audiences and attract a younger demographic to the opera house. Oakland Ballet's straightforward strategy is to take ballet to the streets -- literally and figuratively. Their latest program, Oakland-esque, a love letter to the artists and musicians who give the city its vibrant soul, closes with the dancers trooping gleefully out of the Malonga Casquelourd Center for the Arts and inviting the audience to join them on the street as they wrap up the final number, artistic director Graham Lustig's irresistible Turfland. Against the bold backdrop of urban art by Samuel Renaissance, Lustig showcases the talents of Garion "Noh-justice" Morgan and Rayshawn "Looney" Thompson of the famed Turf Feinz crew, drawing out the similarities between their style of hip hop and ballet. 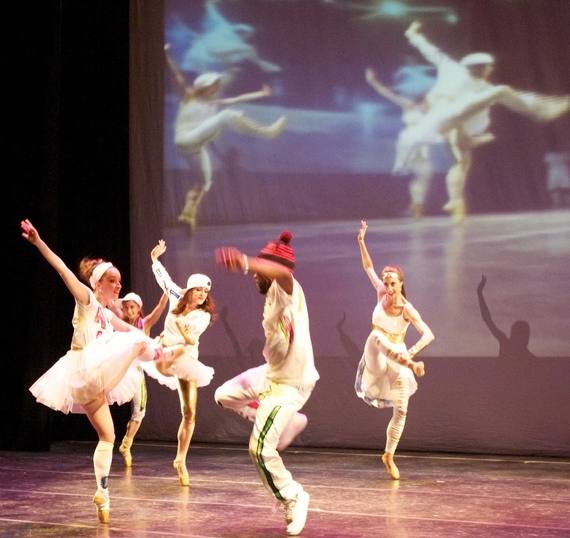 The terrific Oakland Ballet dancers -- the women in tutus with knee socks and ripped tights, the men in sneakers -- bust all kinds of moves: moonwalking on pointe, pirouettes on the tips of their sneakers, flips, body waves, tutting. Sonsherée Giles and Joel Brown from Oakland's acclaimed physically integrated dance company, AXIS Dance, join in the fun, expertly maneuvering Brown's wheelchair in a series of daredevil spins and flips. In a nod to the complex geometries of ballet, Lustig deftly weaves the dancers in and out of formations more formal than the typical b-boy and b-girl battles. In the most telling of contrasts, Steph Salts explores the dynamics of balancing in a forced arch on pointe on one leg, shifting her head, arms and upper body to maintain her balance over a flexed hip, knee and ankle; seconds later, Noh-Justice takes on a similar challenge while balancing in a deep pistol squat on one leg. In a moment both comic and poignant, the sound of rain interrupts the music, and the men hike the women into the air as the women extend their bodies rigidly parallel to the ground -- like umbrellas. Street dancers are always prepared for weather. The program opens with Sonya Delwaide's smart and sassy Rocky Road, a tip of the hat to the Oakland inventors of the ice cream flavor during the Great Depression, and to Oakland jazz great Earl "Fatha" Hines. The pointework is jazzy and delightfully stilted, amid a cascade of cheeky gestures, stomping, leaning, lunging, wiggling and hitch-kicking. Brief solo turns elicit admiring Whoa's from the ensemble, attired in snappy athletic-inspired wear and fire engine red pointe shoes and ballet slippers. Molissa Fenley's cerebral Redwood Park provides a sharp musical contrast to the rest of the program. Scored entirely for an array of percussion instruments (gong, elephant bells, temple blocks, bongos, ratchet, woodblocks, and bass drum) by Joan Jeanrenaud, and requiring a highly precise interplay between musicians Nava Dunkelman and Anna Wray, the piece is meant to convey the feeling of hiking the Oakland redwood trails. The choreography explores the timbres and rhythms of the score - impressionistic, and without a dramatic arc, it calls to mind some of Merce Cunningham's work. With their stiff, hyperextended arms and simple, playful movements that include flat-footed turns, floor skimming hops, and leg swings, all executed with balletic precision, the dancers in their jewel-toned pajamas might have been birds flitting among the redwoods. The high point of this ambitious program of world premières was Robert Moses' TIP, set to the music of bass guitarist Larry Graham (of Sly and the Family Stone fame, and later, Graham Central Station). Graham pioneered the technique of slapping the electric bass, which has since defined the modern funk genre. Moses winds provocatively around the beat of the music, his dancers invariably elegant as they slide, twist, and explode off the floor, vibrating at a very high frequency. The women, clad in halter tops and playfully printed short shorts, bounce off the men, in matching bike shorts and muscle T's, with the super-cool attitude of "I got this." The women often initiate the whiplash lifts and spins, and at one point, a man kicks a woman in the shoulder, trying to raise a little hell, but she isn't fazed, just flashes him a grin. Vincent Chavez and Emily Kerr are superb in a feisty duet with breakneck transitions in which neither of them appears to break a sweat. Moments later, the two-timing Chavez is wooing Steph Salts in a more overtly sexual and hungry mood. Things with Salts don't seem to work out either, and Chavez expresses his loneliness and frustration in an intense, savage solo. Salts won't give Chavez the last word, however; she reappears for a blistering solo that hooks the riveting and lyrical Matthew Roberts. They dance together on her terms -- without physical contact. A magnificent close to a captivating work that takes us to unexpected places emotionally and intellectually. It is a great pity that Oakland Ballet's resources only stretch to the briefest of seasons. A program that celebrates this spirited city with such style and invention deserves a long run, in many different venues. Purists may grumble, but this is the future of ballet. Companies in other cities should pay attention. 1. Oakland Ballet Company dancer Vincent Chavez (left) and Rayshawn "Looney" Thompson (right) of the Turf Feinz in Graham Lustig's TURFLAND. Photo by David DeSilva. 2. (Left to right): Oakland Ballet Company dancer Sharon Wehner (left), with guest dancers from the Turffeinz, Rayshawn "Looney" Thompson (center) and Garion "Noh-justice" Morgan (right) in Graham Lustig's TURFLAND. Photo by Christopher Dunn. 3. 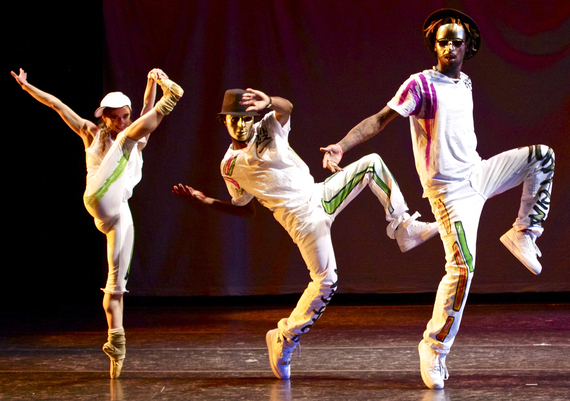 (Left to right): Oakland Ballet Company Dancers Steph Salts, Sharon Wehner and Megan Terry, Rayshawn "Looney" Thompson of the Turf Feinz, Oakland Ballet Company dancer Tori Jahn in Graham Lustig's TURFLAND. Photo by Christopher Dunn.